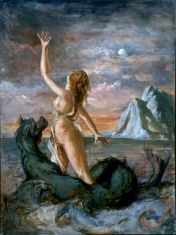 In one of the ancient Greek Creation Myths, Eurynome, the Goddess of All Things, created the seven planetary powers, and set a Titan and Titaness over each. So how do we take that as astrologers? These days we tend to say the planets do not cause events to happen, only naïve people think that, we are more sophisticated. Rather, it is a matter of synchronicity, the cycles of the planets reflecting cycles in human affairs. But it seems that in ancient times the planets really were powers, and I think as astrologers we feel that too, that is why we are astrologers. We feel the powers of the planets just as the ancients did, and it is therefore not quite right for us to say that the planets do not cause events. Of course the planets influence human affairs, we kind of know that and feel that, let’s be honest about it. It just leaves us in a bit of tricky position when facing the modern ‘rational’ scientific way of looking at the universe. How could a lump of rock millions of miles away be influencing human affairs? But a planet is only a lump of rock when viewed through our Earth and Air faculties: the Earth faculty only sees physical evidence, discernible through the 5 physical senses. And the Air faculty then creates theories based on that evidence. Where does that leave Fire and Water, our ability to know and feel the power of the planets? I think it is important we do not make concessions to modern ‘rationality’, which is not rationality at all. Rationality comes from the word ratio, and is connected to ration. It is about proportionality, seeing things in a balanced way, every element having its say. Modern ‘rationality’, which often considers only Earth and Air to be means of knowledge, is not balanced at all. It is for naïve people who take the world at face value, who believe that only what comes in through the 5 senses is real, that there is not a deeper less obvious dimension which is actually the source of everything we experience. Ad Break: I offer webcam astrology readings (£20 per ½ hour). Contact: Dharmaruci71(at)hotmail.com. I’ll be travelling in Canada and the USA this year doing readings and talks – if you’d like me to drop by, let me know! "What it will be Questiond When the Sun rises do you not see a round Disk of fire somewhat like a Guinea? Heavenly host crying Holy Holy Holy is the Lord God Almighty. There you have it. Blake experienced the power of the Sun just like we do. And he looks through his eyes, not with them. We are not the window, we are the observer standing behind it. So where does this leave our precious Free Will, if the planets cause events? I think the argument about Fate versus Free Will is mainly an argument between medieval Christianity and what came afterwards, the so-called ‘Enlightenment’. A swing from a one-sided emphasis on faith and tradition to an equally one-sided emphasis on human reason. And a division of the world into ‘inner and outer’. Either we are acting or being acted upon. Free Will or Fate. I don’t think that the planetary powers acting on human affairs makes us simply creatures of Fate in the modern sense. I think it’s more that the Universe is ensouled, in a sense it is one big soul of which we are a part. Everything is a part of, and affects, everything else. So the planets as gods are not external forces acting on us in the sense of something completely separate from us. But they are not the same as us either. It’s a different way of thinking which I suspect is closer to how the Greeks would have experienced their gods. In a sense they ARE separate, they need to be honoured, considered, listened to. But they are also intimately bound up with who we are and our destiny. Yes, we have a destiny, the future in a sense is all laid out before us. And we are living according to nature, which as Jung said is the best way to live, if we let the gods lead us there and let ourselves be dragged through whatever we need to be dragged through in order to learn a few things. But it’s also our choice to go there. And there are consequences if we choose not to go there. If, in other words, we ignore the gods. Like Odysseus who, inflated with his military success after the Trojan war, thought he did not need to propitiate Neptune for his sea journey home. And so it took him 10 years. This way of thinking is, I think, a necessary consequence of being an astrologer, because as I said at the start, we are astrologers because we feel the power of the planets. That is our starting point for the way we see the universe, that there are these planetary powers that influence ourselves and the rest of humanity. Then we have to ‘go figure’! 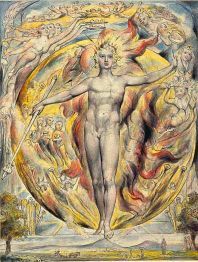 I like the idea of Fate, of a pre-existing pattern to our life – well what is a birth chart if not that? Fate gives me a sense of a power and a meaning in the universe. We can’t just be whatever we choose to be, that is a modern delusion. But there is something there for us if we allow the gods to show us the way. 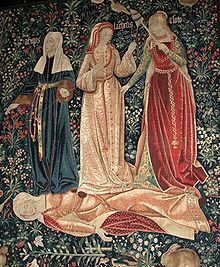 In ancient Greece there were 3 female Fates: Clotho, who spun the thread of life from her distaff onto her spindle; Lachesis, who measured the thread of life allotted to each person with her measuring rod; and Atropos, who was the cutter of the thread of life. She chose the manner of each person's death; and when their time was come, she cut their life-thread with "her abhorred shears." In the Republic of Plato, Lachesis sings the things that were, Clotho the things that are, and Atropos the things that are to be. 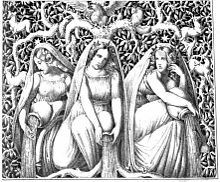 In Norse mythology, there are numerous Fates or Norns (again, female) the 3 most important of whom are Urðr (Wyrd), Verðandi and Skuld, whose names also refer respectively to the past, present and future. They live in a hall by the Well of Fate, from which they draw water, and they take sand from around it, which they pour on Ygdrassil, the World Tree, so that its branches do not rot. They are “maidens deep in knowledge” and choose lives for the children of mankind. I would love your take on this DR. Thank you again for another thoughtful post! Hi - I just posted an article exploring some of the concepts you introduced here. Just thought you'd want to know, since I'm about to post it over at FB as well. Thanks for this post. It opens the door to some interesting speculations. Love the article, particularly the concept of air/earth thinking and fire/water thinking. Always thought we feel the planets on a level beyond our logical brain.